BEIRUT: Extremists from ISIS closed in on Syria’s ancient metropolis of Palmyra Friday, hours before seizing a government headquarters in the strategic Iraqi city of Ramadi. 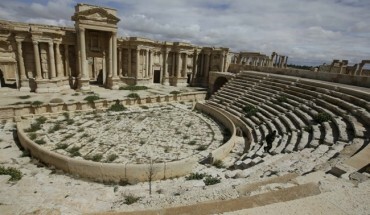 Jihadi fighters advanced to within one kilometer (less than a mile) of Palmyra, a UNESCO world heritage site featuring Roman colonnades and an impressive necropolis, the Syrian Observatory for Human Rights said. “We are very worried,” UNESCO director Irina Bokova said Friday at a news conference in Beirut. “We are following the situation, because this is an ancient Roman site of very high value,” she said, renewing her call for “all relevant parties to protect” the famed desert oasis. Bokova, who spoke in French, highlighted the importance of working “against extremism, against this strategy of eradicating … our collective memory” used by ISIS, which has already destroyed archaeological treasures in Syria and neighboring Iraq. The National Coalition, Syria’s main opposition group in exile, said ISIS would be committing “a crime against civilization” by destroying Palmyra, adding that the regime had not done enough to protect the 2,000-year-old city. Syria’s army sent reinforcements to Palmyra Friday. “The army is bombing the surroundings of Tadmor from the air,” said Rami Abdel Rahman, director of the Britain-based Observatory. “Islamic State [ISIS] group jihadists are now one kilometer” from the ruins, he said. Since the ISIS offensive began early Wednesday, more than 138 combatants – including 73 soldiers and 65 jihadis – have been killed. And at least 26 civilians were executed by ISIS, including 10 by beheading, after they were accused of “collaborating with the regime” in villages near Palmyra overrun by ISIS. “The army has sent reinforcements and it is bombing the [ISIS] positions from the air,” Talal Barazi said. According to Barazi, the inner city houses about 35,000 people, including displaced Syrians who fled there after their home towns were engulfed in violence, and the suburbs host roughly another 35,000. The Observatory said that more than 100,000 people lived in and around Palmyra. The historical metropolis stood on a caravan route at the crossroads of several civilizations, and its first and second century temples and colonnaded streets mark a unique blend of Greco-Roman and Persian influences. It also houses a series of old and beautifully decorated tombs, where the richest Palmyrans were buried. ISIS would see such cultural treasures as targets, after the group was filmed destroying the Iraqi archaeological sites of Nimrud and Hatra. Since Syria’s conflict began four years ago, Palmyra has been looted and its architecture has already been damaged by clashes between rebels and the regime. Also Friday, ISIS seized the main government compound in the western Iraqi city of Ramadi, giving them nearly full control over Anbar’s provincial capital, the group and officials said. ISIS “now occupies the government centre in Ramadi and has also raised its flag over the police HQ for Anbar,” a police major told AFP, speaking on condition of anonymity. The group itself issued a statement saying its fighters “broke into the Safavid government complex in the centre of Ramadi”, using a derogatory term for government forces. IS has threatened to take Ramadi for months, and its breakthrough came after a wide offensive on several fronts in Anbar, including an assault using several suicide car bombs in the city Thursday. If the group manages to take all of Ramadi, it would control the capitals of the two largest provinces in Iraq. Mosul, capital of the neighboring province of Nineveh, has been in ISIS hands since June 2014.